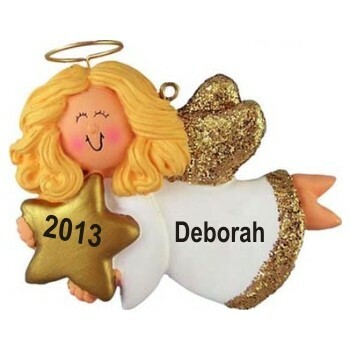 Show your favorite gal just what you think of her with the angel with star female blonde personalized Christmas ornament boasting a darling face, cute design and enough glitter to really make it shine. We hand paint the name and year onto these angels ornaments personalized to be cherished forever when received in our posh and pretty velvet pouch. Use the attached display cord to hang the blonde female angel with star personalized Christmas ornament wherever it reminds her most often of your love and admiration. For our family christmass tree Jan 2, 2014 mary d.